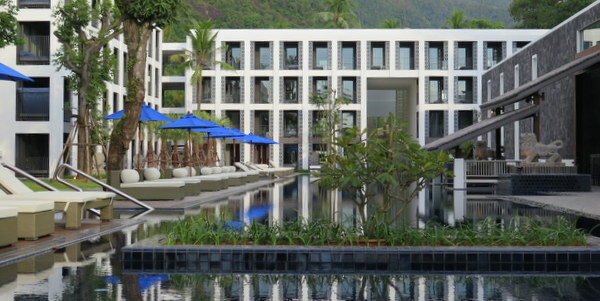 Opened at the end of 2014, The Awa Resort is Koh Chang’s newest luxury hotel. Located on Kai Bae Beach, The Awa Resort is split into two sections on either side of the main road. The principal resort is on the ocean side, the superior hillside rooms sit across the road, literally a two minute walk from the reception area. With a subtle modern Oriental twist, sharp lines and brushed concrete, The Awa Resort has 120 rooms, feature length swimming pool, bar and restaurant together with a wonderfully dramatic entrance area complete with 10 metres doors and high lobby ceilings. The resort has a specially constructed private beach area and direct access to the sea, which will come right up to the front of the terrace at high tide. Feedback from guests suggest taking extra care when swimming here as underfoot is a combination of sharp rocks and corals. At low tide, you can walk straight out onto the public beach up to the northern headland. An extensive Western and Asian buffet breakfast, eggs and coffee to order, is served daily in The Spoon restaurant, with an all day menu kicking in afterwards. The Sala provides the evening menu on a raised terrace overlooking the sea, The Sand bar shakes the sunset cocktails alongside. By the pool, you can swim up to The River to order light snacks and drinks, whilst The Teas rounds things off, an elegant spot to kick back and relax in the main front building. The rooms are all finished to the highest spec with everything from TVs, a/c, spacious bathrooms, power showers, complimentary bathroom accessories through to mini bars and safes. The Awa Spa is open daily from 10.00am to 20.00, with massage, sauna and treatments in ultra cool, soothing surroundings. When The Awa Resort first opened, there was a period when inexperienced staff were stretched to the limit and complaints about service were frequent. Almost a year on, things have now settled down with satisfied guests reporting back ever improving standards of customer care. The Awa is wonderfully stylish, chic and modern. Its rooms are sumptuous, comfortable, its public areas sophisticated and cool, its pool terrific and it has cleverly created a bonus private beach area within the confines of the resort. On the less positive side, the food and drink, price in particular, does not satisfy all guests, extraneous noise between the rooms crops up and service is being learnt a little as the staff grow with the resort. The sea too is not perfect for swimming and this stretch of Kai Bae Beach does get high tides. 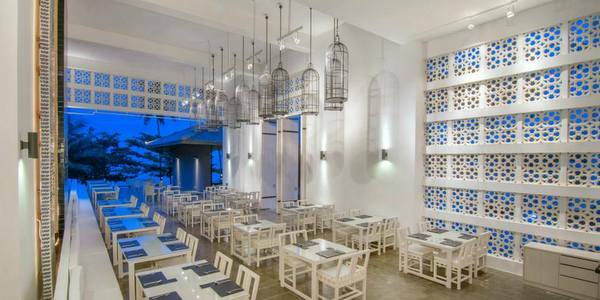 But these are perhaps minor quibbles and for us, The Awa Resort has, in a blink of an eye, established itself as one of Koh Chang’s premier luxury resort hotels. Infants up to 2 stay for free, though cots will be charged; children from 3 to 12 use an extra bed (charged); over 12s are considered adults. No pets allowed. Kai Bae Beach is one of Koh Chang’s most popular areas as it offers a bit of everything, attracting families, couples, independent travellers, flashpackers and backpackers. It has a relaxing mix of Thai and western restaurants, fun bars, though it’s not a party zone and plenty of shops. There are some great stretches of beach too, especially at the southern end, offshore islands, an elephant camp and even a hidden waterfall. Koh Chang Resorts, Hotels, Villas, Bungalows, Guesthouses and Hostels.